Bright sunshine, but cold temperatures this Friday morning on California’s north coast — the heavy rainfall felt the last few days is supposedly over until at least next Tuesday. Clear and cold til then, though. Chilled as in a ‘Freeze Watch‘ starting tonight and on into Saturday — the NWS calls for temperatures in the upper-20s to low-30s across the region. Precipitation, however, so far this season has been a literal flood. Yesterday, according to the Department of Water Resources, rain gauges in the northern Sierra Nevada revealed rainfall 80 percent above normal. 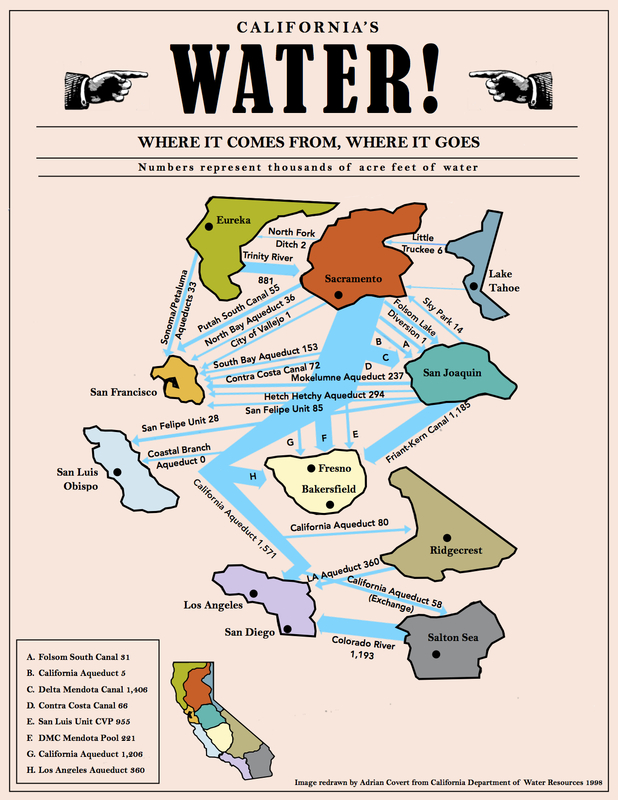 Northern California gets the rain, and holds all the major reservoirs for the rest of the state — as the chart above explains. We’re also out of the drought problem, and have been for some time, even as SoCal stays dry. Shasta Lake, just north of Redding and most-likely California’s biggest reservoir, is reportedly at 67 percent capacity, 110 percent the historical average. So deep, water has to be released — right now, the Bureau of Reclamation is releasing 5,000 cubic feet per second of water about three Olympic swimming pools per minute. Still north of the divide. Los Angeles in the heat-heart — the NWS reported ‘the last five years were the driest ever documented in downtown L.A. since official record keeping began almost 140 years ago,’ rainfall during that period totaled just 38.79 inches, roughly half of normal. But Lund said that even as conditions have gotten wetter, the state has struggled to move surplus water south across the delta. As a result, the benefits have been limited. The recent rains were enough to force federal officials to begin releasing water from Folsom Lake to protect against flooding for the first time since March, said Louis Moore, a spokesman for the Bureau of Reclamation, which manages the reservoir. Since the beginning of December, Folsom has risen more than 20 feet — an increase of about 55 billion gallons. As of last week, the U.S. Drought Monitor reported that drought conditions no longer apply to about 27-percent of California; it should come as no surprise that all the areas where the drought has relented are located in the upper reaches of the state.